Prepare staff schedules and more. Is there a better alternative to Xpress Schedule? Is Xpress Schedule really the best app in Applications category? Will Xpress Schedule work good on macOS 10.13.4? Xpress Schedule is designed to simplify the painful and time-consuming process of preparing staff schedules. Getting started is quick and easy. Just enter some basic information on your organization and staff and you're ready to create your first schedule. Create schedules in minutes rather than hours or even days. Maintain and refer to staff information such as positions, payroll information, ratings and availability. Time Off Requests are tracked to avoid scheduling conflicts. Supports salaried and hourly employees, split shifts, vacation and training scheduling. Xpress Schedule needs a rating. Be the first to rate this app and get the discussion started! Create schedules using a simple drag-and-drop process. Benefit from a visual picture of who is working when and what coverage is planned. Now, your schedules will be more accurate and take less time to prepare! And when you're done, you'll know your labor hours and costs. Many more features. 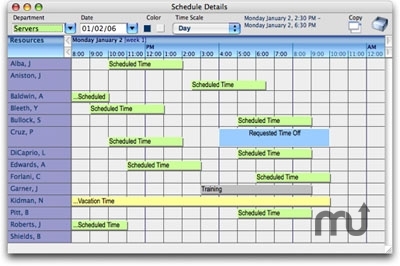 If you prepare staff schedules for your company or organization, then you need to look at Xpress Schedule. It's been designed with easy of use and functionality in mind. Xpress Schedule provides you with all the tools you need to create better schedules in less time, with less frustration for you and your staff.